While at the Arts Presenters conference, I learned that Wesleyan University has a certificate program in Curatorial Practice in Performance. My first thought was to wonder if there was really that much of a demand for such a program. Then I recalled that many arts organizations have long been consolidating their executive and artistic director positions into one person and that there were likely quite a few people who sought the training originating from this situation alone. 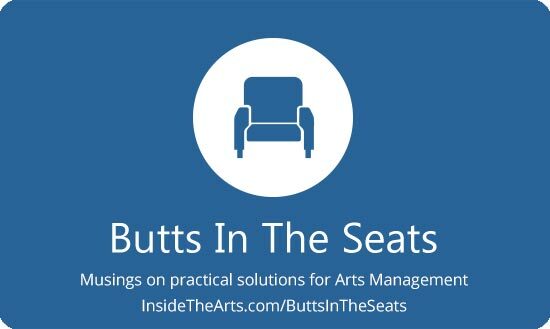 People hired for their ability to run the arts organization like a business might find themselves a little anxious about making the correct artistic decisions. I was in a session where either Program Director Kristy Edmunds or Managing Director Pamela Tatge, (whomever was sitting behind me) noted that the visual arts have long had curatorial training, but it was lacking in performance disciplines. In a separate session moderated by Alan Brown on what drives and inhibits our success, Brown noted that presenting arts organizations are becoming increasingly interested in having a curatorial relationship with artists rather than just taking what is offered. Given that most contracts coming across my desk stipulate that the artist has sole control over the artistic content of the show, I wondered if there is going to be a lot of pressure to on that very common contract clause in the future. Conceivably, if arts organizations take their responsibility to more effectively serve and engage their community to heart, they will have a better sense of what their community will respond to than the artist. I am not talking about pressing artists to tone down edgy elements in the performance to conform to local tastes. Rather I envision a presenter may ask that a particular piece be performed knowing how it will resonate with the history of the location or address an on going concern of the region. Brown noted that a few performing arts organizations are soliciting requests for proposals (RFQ) from performing artists so that projects more closely conform with what they want to achieve. RFQs from visual artists aren’t uncommon, and Brown says there aren’t a lot of performing arts organizations soliciting, but the fact there are may represent a shift in the approach to residencies. Pam Tatge who was on the panel for this session commented that artist residencies were becoming an intersection of the artist’s goals and presenter’s goals. It seemed to me that this is something of a compromise between commissioning a piece and hosting an artist for a performance. There is a desire to provide the community a deeper experience than might be derived from attending a performance but not enough resources to direct the creation of a new work. So presenters are seeking artists who can provide additional experiences with specific relevance to the local community. These additional experiences seem to tend toward interaction and working with members of the community and de-emphasize the lecture/demonstration model. It just occurred to me that another one of the underlying themes of the conference seemed to be the blurring of distinct roles. In addition to a session specifically about cross-discipline performance curation, there were two different sessions on the dissolving boundaries between agent, manager and producer with people taking on the functions of all three in various situations. Those were just the sessions specifically dedicated to this idea. Just as the topic of cross-discipline curation came up in a separate session I attended, I am sure the topic permeated other conversations. Where are the positions for Performing Arts Curators? Ben Pryor is an excellent example of someone who has successfully carved out his own path. But what about other emerging professionals who are struggling to break into the field of presenting/programming/curating? As boundaries continue to blur, I wonder about the avenues available to graduates of ICPP go once they’ve completed the program. It seems entirely possible that curating – this new-ish term for responding to a defined community – could wind up being applied to old models of leadership in the arts. I continue to keep my eyes and ears open but I am hoping that as ICPP grows, that an infrastructure develops alongside it to put it’s alums on par with their peers in visual arts curation.